I've had a busy day, I went and got 60 litres of spring water this morning and brewed, swam and cleaned up after brewing. Making beer from scratch takes ages especially once you factor in all the clean up time. I hope the 5kg of spent grain does something miraculous to my compost heap. Anyway with all the boil off and the discarded trub I ended up with 15L of beer (3L off target). 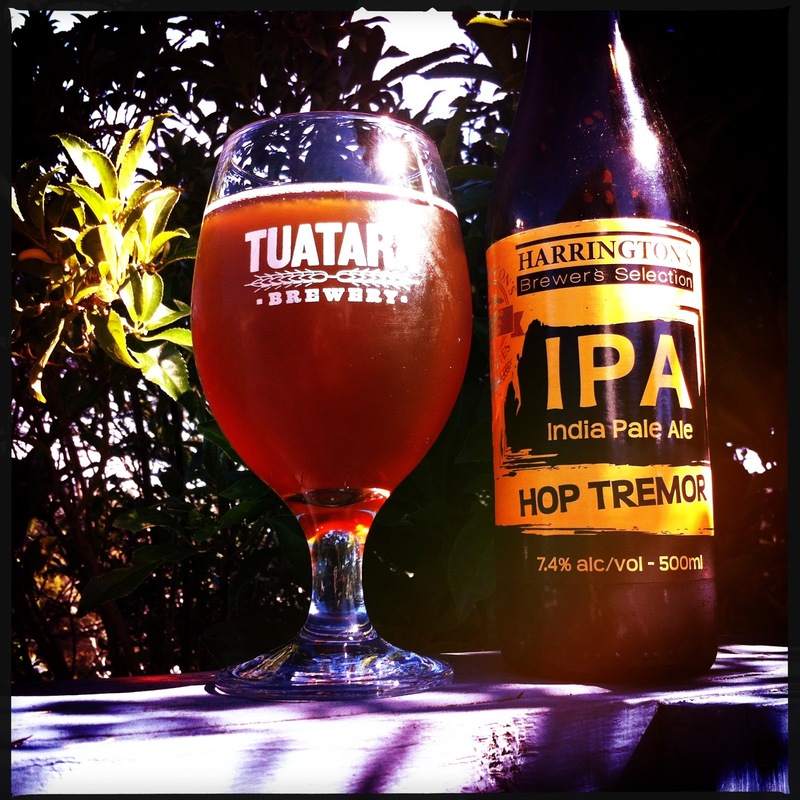 So to console myself over the lost beer to the atmosphere I have opened a Harringtons Hop Tremor. When I open IPA's I expect big aroma but this beer borders on subtlety. There is a definite resinous aroma that tingles the nose and maybe a little spicy bitter orange marmalade on toast. The pour is a beautiful orange amber, fairly clear (the condensation on the outside of my glass hides this). A thin head that dissipates rapidly and not much in the way of lacing. Where this beer packs its punch is right in the tastebuds. All those subtle aromas bust into life, the pine, the marmalade and they sit in a dry syrupy caramel malt thats coasts the tongue and leaves the bitterness lingering long after the amber liquid is swallowed. The dryness make the bitterness even more pronounced and after a while the beer begins to feel a little unbalanced. Its feels a bitter for the sake of being bitter and if you like bitter, its not a bad thing. But it feels to me like its slightly missed the mark.